..:: 28 Years of Academic Excellence ::..
Sri Triveni School is one of the oldest schools in Hyderabad with three decades of History built on a foundation enriched with great value system and cultural heritage. Late Sri Anji Reddy garu with his vision to empower the society by educating the needy has started this thousand mile journey as a humble step towards constructing a society that is progressive in thought and effective in action. Presently his Vision and Mission are being taken forward by Sri J. Surender Reddy garu and Sri K.Goverdhan Reddy garu with utmost determination and due focus that is needed to transform this school. Thousands of our students spread across the country and globe are enjoying their professional success which is a fruit of yester years value based education imparted by us. Probably Sri Triveni is the only school having that edge of moulding the students of hundreds of families for over two to three generations. We are proud to share the fact that many among our alumni prefer to join their children here itself. 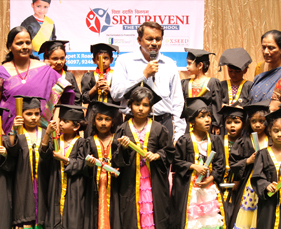 At SRI TRIVENI our promise and parents belief : children are in the safest hands and under right direction.